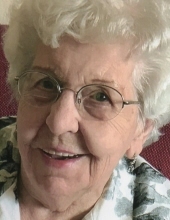 Martha L Myers, 96, passed away peacefully surrounded by family on February 6, 2019 at Agrace Hospice and Palliative Care , Janesville. Martha was born in Madison, WI, to Rudolph Sr. and Sena (Thompson) Hatlevig. She graduated from Evansville High School in 1941. She married Wayne Myers in Fayetteville, NC on May 20th, 1943 before the Army sent Wayne overseas. Martha was a devoted wife and mother who loved her family more than anything. She enjoyed playing cards, was the family barber, and truly enjoyed family gatherings. She was very knowledgeable in her Norwegian heritage, where she traveled to meet relatives some years ago. She was a founding member of the Sons Of Norway, Janesville. She was known to family and friends as a prolific mover of furniture around her house. A visit there usually included her specialties, baked spaghetti and banana bread. She is survived by daughters, Barbara “Bobbie” (Frank) Drew, Janesville, Nancy (Mark) Stone, Smithville, MO, and son Randy (Stacy) Myers, Janesville, grandchildren Dan, Erika, Tom (Kelly), Ryan, Sara (Joe), Angie (Matt), Courtney, Becky, Jackie, great grandchildren Kasey, Joel, Laci, Joey, Gracie, Hucklebarry, and great, great granddaughter Isla. Also sister-in-law Judy Hatlevig, former sister-in-law Dee Leeder and many nieces and nephews. Martha was preceded in death by her husband Wayne on February 18th, 1994, her parents, six brothers, Milo, Stanley, Ronald, Vernon, Rudy Jr., and Earl “Bud” Hatlevig, who died Saturday, February 2, 2019 in friendship, WI. Funeral services will be held at 1:00PM on Monday February 11, 2019 at Ward-Hurtley Funeral Home Evansville with Reverend Bruce Gray officiating. Burial will follow in Maple Hill cemetery Evansville. A visitation will be held from 11:00AM until the time of service on Monday at the funeral home. The family would like to extend their thanks to everyone at Agrace for the exceptional understanding and care provided to Martha and the family. She was treated like she could have been their mother. In Lieu of flowers memorials may be made to Agrace Hospice and Palliative Care in Janesville or The Salvation Army in Janesville in Martha's name. To plant a tree in memory of Martha Lois Myers, please visit our Tribute Store. "Email Address" would like to share the life celebration of Martha Lois Myers. Click on the "link" to go to share a favorite memory or leave a condolence message for the family.